A facebook group I frequent auctions numerous gaming items, sometimes common and sometimes very rare. Several of the members are known gaming industry talents, and others are just collectors like myself. At the end of November, Garrett Ratini put up an item that was a rare gem from his collection. It wasn’t a game book, but books containing a surprisingly rare set of photos that made up a part of gaming history. And how the auction ended is where the real surprise happened. The items auctioned were the 1953 and 1954 years of the Geneva Log, the Lake Geneva High School yearbook. It was during these years that Gary Gygax, Don Kaye and Mary Powell were all in attendance. A treasure for the gamer who wants to own a piece of history, but especially for the rarity of the photos inside. To appreciate just how rare, you have to know a little something about the history of these three individuals. Gary Gygax, for one, did not finish high school, though did finish his degree years later. A few months after his father passed, he dropped out of high school in his junior year. These volumes then contained rare pictures of him as a student. Secondly, Don Kaye is depicted in the book as well. Don Kaye, a close childhood friend of Gygax from age 6, co-founded Tactical Studies Rules (TSR) with Gygax and made one of the first Dungeons & Dragons characters, the infamous Murlynd. While the depiction of these two legends in one book might not appear to be noteworthy in itself, it is one of the few rare pictures of Don Kaye. TSR was founded in 1973 by Gygax and Kaye. Later, Brian Blume bought in and supplied the capital to allow the publication of Dungeons and Dragons. However, Kaye suffered from a heart condition and needed surgery. He never disclosed this to his partners, and died of a heart attack before the scheduled surgery could take place, dying at age 36 just as Dungeons and Dragons was beginning to gain momentum. As a result, few public pictures of Don Kaye exist. Mary Jo once suspected Gary of having an affair while she was pregnant with her second child, but going to confront him in a friend’s basement, found him sitting with friends around a map covered table. She may have been the first of what my wife calls “Gaming Widows” (being spouses left by the wayside for the husband that games too much). Garrett Ratini put these items up for auction, and the true collectors of gaming history began to come out to bid. The buyout price for the books was $1,200.00 and likely that number would have been met, I suspect, knowing the habits of this community of bidders. But an unexpected bidder placed a bid at somewhere around the $400 mark, and that was Luke Gygax himself, founder of Gary Con and Gary Gygax’s son. With the permission of all involved, Garrett terminated the auction and gifted the books to Luke. Now, these books and images of his mother and father are with him, where they truly belong. Pre-digital history like this is easily lost, and is not on the radar of many historians, with the exception of Michael Witwer and Shannon Appelcline. Hopefully books like this will make it into the archives like the one held at GenCon 50 this past year. Fortunately, I believe we can anticipate these books being treasured by the Gygax family, both for themselves and for posterity. 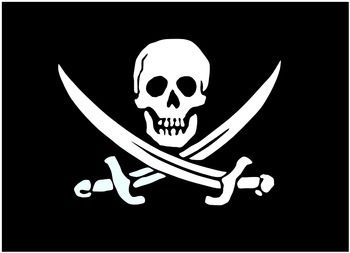 Last night the pirates campaign got under way again, with my 4e conversion of B4 – The Lost City. I did my best to keep the spirit of the original, but since our party is made up of pirates at sea, the top of the temple was just above the water, rather than above the dunes. 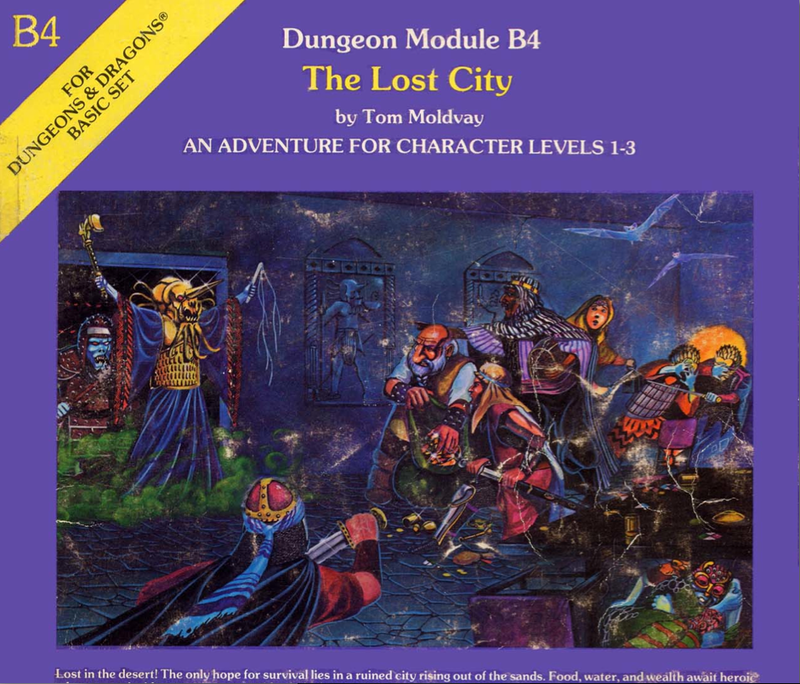 Unlike a lot of the more recent 4e mods in the Scales of War adventure path and certainly the Living Forgotten Realms mods, this was a much more traditional dungeon crawl. Originally published in 1982, the majority of adventures at that time were crawls. It was refreshing for me, after playing a lot 4e over the past few years, to recapture some of the old school feel. Some might think that it would be difficult to challenge the party given the mechanics of healing surges and the relative power of 2nd level 4e character as compared to the power of a 2nd level 1e character. I countered this in a few ways. First off, all the monsters they faced had 4e stat blocks. Several of them had already been restated and were waiting for me in the compendium, or monster vault. Others I needed to find a suitable substitute, but even that wasn’t tough. For instance, in one room the party encounters an enormous beehive with foot-long bees. While there aren’t any 4e giant bee stats, there are giant ant stats. Change their climb speed to a fly speed, stat-up an encounter-power sting, and viola: 4e Giant Bee. A third aspect that was really fun to see again was the party checking pretty much any door they came across for traps. The mod did a great job of setting this up by leaving scattered bodies of previous explorers who had set off traps ahead of the party. Also, the first room they encountered one of the party fell through the floor to a chamber with several fire beetles. While the rest of the party descended to assist their comrade, the wizard sat back and hurled a spell or two whenever it was advantageous, only going in to the room after freezing the last beetle to a wall with a ray of frost. Playing an old school mod also got the players in an old school frame of mind. Early on, one of the characters gathered up some old, sludgy oil that could be used as smoky flasks of oil. When the party encountered the giant bees, he had the brilliant idea of using the smoke from the burning oil to make the bees docile. When is the last time a 4e character in your game, scrounged up some material and used it to avoid a fight? Brilliant. The pirates have managed to scrape together a little water, and they took the time to cook and send back some giant lizard they had freshly slain. To keep the crew fed, they’ll have to journey deeper into the underwater structure. The party found a stairway down, but wisely chose to explore the rest of the floor they were on before charging off into the unknown. It was a great session and I’m really looking forward to next week!